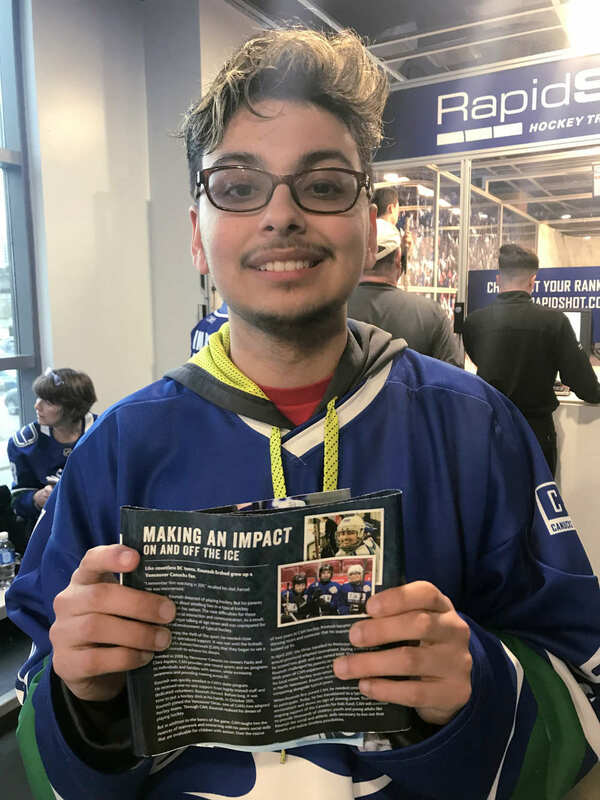 A condensed version of this story was featured in the Vancouver Canucks game-day program for their April 3, 2018 celebration of Autism Awareness Day. This story first appeared in AAJ Magazine‘s January 2018 issue, as well. 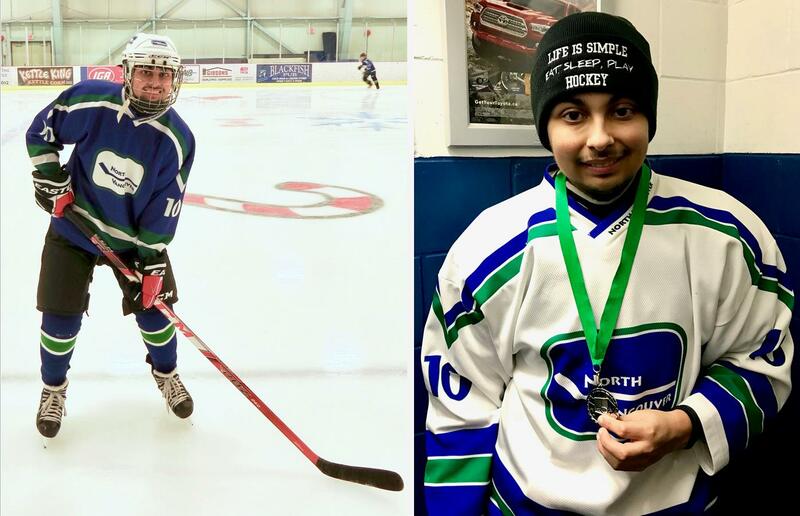 Like countless BC teens, seventeen-year-old Kourosh Ershad grew up a huge Vancouver Canucks fan. Since then, Kourosh dreamed of playing hockey. But as a child with autism, Kourosh faced a number of challenges to participate in sports and rec in the same way as his typically-developing peers. While there is significant variability among those who share the diagnosis, the core difficulty with individuals with autism is social communication. Enrolling Kourosh in a typical sports program meant throwing him into a fast-paced environment that he was likely unprepared for. In order to enjoy the thrill of sports he was fascinated with, it was clear he needed close attention and individualized support. 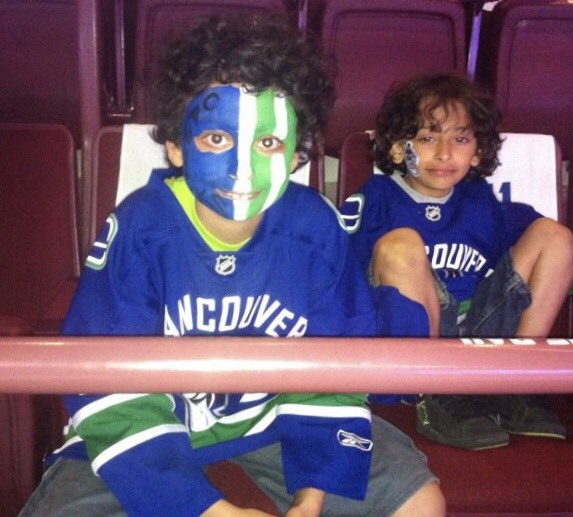 It was not until the Ershads found Canucks Autism Network (CAN) that they began to see a path for Kourosh to achieve his dream. Since 2008, CAN has successfully delivered a wide range of sports and recreation programs to children and families with autism across BC. As his skills progressed in the skating program, it was time to put a hockey stick in his hands. In October 2015, Kourosh joined the Vancouver Orcas, one of CAN’s two adapted hockey teams. Through CAN, Kourosh could realize his dream of playing hockey. 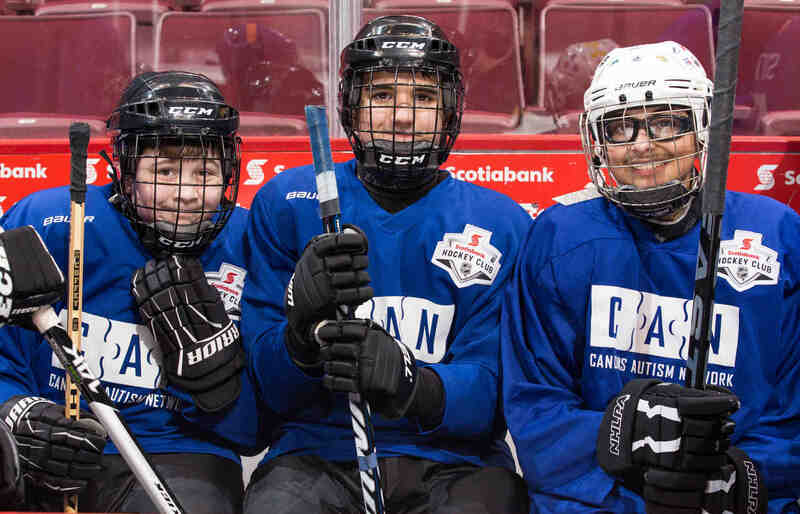 Kourosh not only learned the basics of passing, stickhandling and shooting, he was taught the nuances of interacting with his peers and teamwork — social skills that are invaluable for children and youth with autism. Kourosh thrived. Week after week for two years, his confidence grew. This past September, Kourosh signed up for his local bantam team. To his family’s surprise, the new team was led by a coach that had previously worked with CAN. 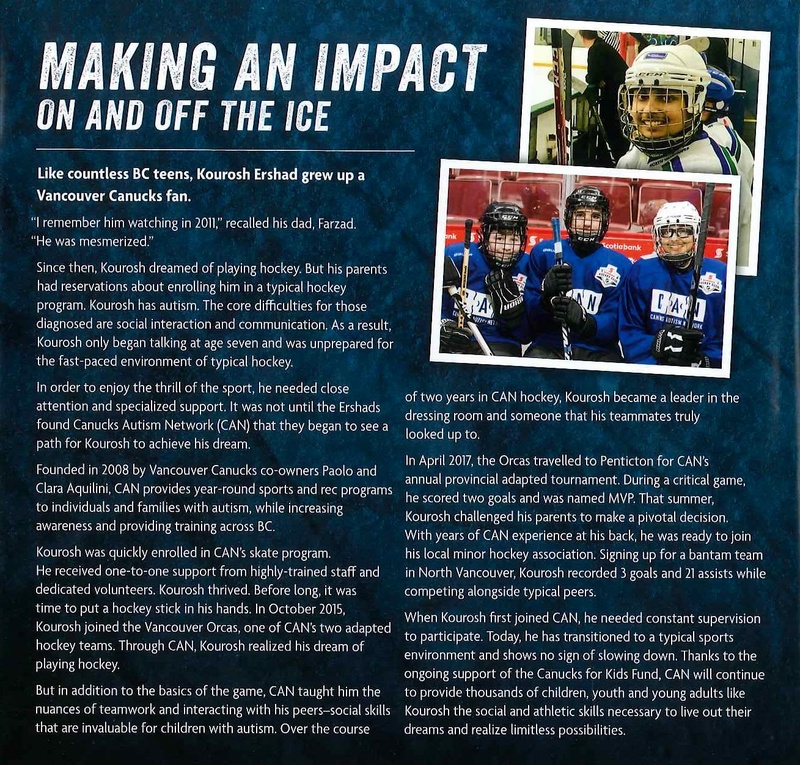 Kourosh’s new coach was able to work with the Ershads to ensure a smooth transition from CAN’s adapted setting to the relatively less-supported environment of a minor hockey team. When Kourosh first joined CAN, he needed constant supervision to participate. Equipped with the social and athletic confidence gained through CAN programs, he has successfully transitioned to a typical sports environment in his community. At the conclusion of his first season with North Vancouver Minor, he recorded 3 goals and 21 assists. Of those 24 points, he registered 5 points in the playoffs, where his team finished second. Kourosh is living his dream and showing no signs of slowing down. Kourosh and the Vancouver Canucks game-day program featuring this story.